Home Breads Crackers and Crisps FLAX: THE ULTIMATE SUPERFOOD? Little bags of tasty, grain-free cereal and granola from a company called FlaxGold were included in the swag bags everyone received at check-in on the last Low-Carb Cruise. The main ingredient was, as you may have guessed, flax. Flax has become popular in diet foods where it is used to lower the calories and increase the fiber. It is also used as a zero-carb thickener and flour substitute in low-carb recipes and flax oil is sold as an omega-3 supplement. Many low-carbers are eating flax in great quantities and some of the most respected experts in the low-carb community recommend it. Dr. William Davis’s best-selling book, Wheat Belly, the one that has been making headlines and cutting into bread sales (and paring Bill O’Reilly’s waist circumference) includes 29 recipes, 10 of which are made with flax. An online search for “flax” will turn up many sites extolling its virtues for just about everything, including high cholesterol, blood glucose control, menopause symptoms, cancer prevention, inflammation, arthritis, and weight loss. It has been called a “super-food” because of its high levels of soluble fiber and good fat. The hype reminds me of something else that was promoted as the ultimate health food ~ soy. But, just as with soy, a little more research reveals that there may be more to the story. One evening on the cruise, I happened to sit next to an attractive young couple who introduced themselves as Jeremy Hendon and Louise Yang, the proprietors of FlaxGold. In the course of conversation, I expressed my concerns about flax. I suggested that they do an online search for the dark side of flax and offered my two cents worth of advice about what I considered a better alternative. Much to my surprise and delight, Louise recently contacted me to tell me that her company had changed its name and they had reformulated their product line. It is now called, “Louise’s Foods,” and all their products are made with chia! They sent me some samples to try and I am happy to say that they are every bit as good as the original versions. They have Cinnamon Raisin Granola and Breakfast Bites, in 2 sizes, on their product page so far. The Breakfast Bites are pictured as cereal, but they can also be used like crackers or little cookies and they can be crumbled over fruit or ice cream to make a crunchy topping. Since Louise and Jeremy asked me for feedback on the new chia line, I gave them my wish list: granola with dried cranberries (the raisins are a bit high in sugar for me), sugar-free chocolate chips, and/or cocoa nibs. 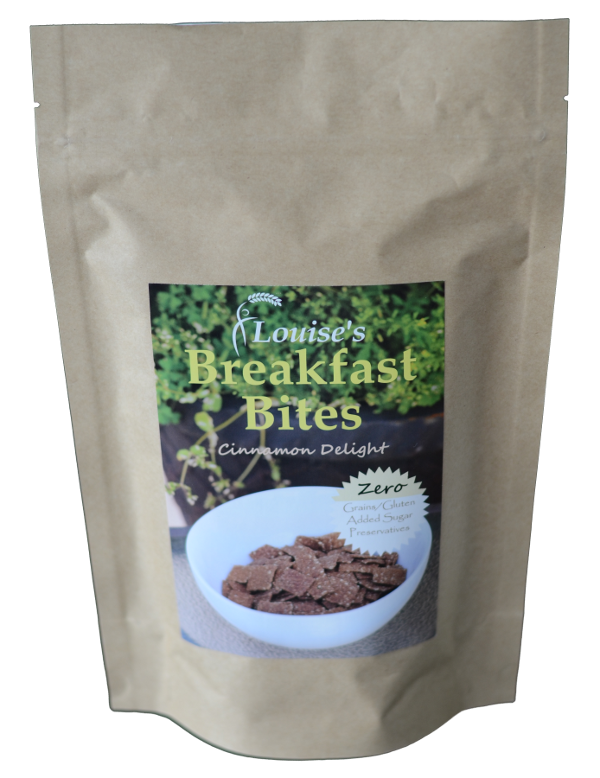 I hope you will check out the Louise’s Foods website at www.louisesfoods.com and their Face Book Page and support their effort to make healthful, low-carb foods. I’m sure they would be as open to your ideas and suggestions as they were to mine. The flax plant gives us linen fabric and linseed oil, which is used as a supplement and as a drying agent for oil paint. The edible seeds can be used whole or ground into flour. Linseed oil contains the precursor to omega-3 oils, an essential fat found in eggs, fatty fish, krill, and in the meat, fat, organs, and bone marrow of animals. Linseed, chia seed, walnuts, and a wild plant called purslane are among the few plant sources for omega-3 oils. The omega-3s in flax are highly unsaturated and therefore very fragile. They quickly become rancid with exposure to air, heat, and light, so flax meal should only be eaten when freshly ground. The whole seeds are more stable, but although the fiber will still serve as a laxative, the nutrients are only available when the seeds are ground. Ground flax can be frozen, but it should be used within a few weeks. Chia seeds are similar to flax in many ways. Both attract water and form a gel, making it important not to take some medications when eating them, because they can entrap pills and keep them from dissolving. Chia and flax can usually be substituted one for one in recipes, but chia seeds can be digested whole and do not need to be ground to be utilized by the body. They contain complete proteins and two-thirds of chia oil is the omega-3 variety. This is the same fragile oil found in flax, but chia also contains large amounts of natural antioxidants to keep it fresh, even after it is ground into flour. Chia has no lignans or toxins. PS: Oops, forgot the disclaimer–but I already said I had gotten free samples. That’s all! Chia seed, Granola, Jeremy Hendon, Louise Yang, Louise's Foods. Bookmark. The problem with chia is that it is VERY high in oxalates, which need to be limited for those who have difficulty processing oxalates such as those with a history of kidney stones, many with autism and chronic joint pain, and many other people. 1 oz of flaxseed meal has 1 mg of oxalates, while 1 oz of chia seeds has 192 mg! My recommended daily intake for oxalates is 40-60 mg. Oxalates also accumulate over your lifetime. There is an explosion of people with kidney stones. Other “health foods” that are high in oxalates include beets, chard, spinach, nuts, beans, soy, and others. As you can see, chia is not for everyone. I think I now prefer psyllium as a gluten substitute in baked goods rather than chia. Have you heard anything bad about it?